Volume and chapter headings: Volume 1. Inaugural Session. Plenary I: Advanced Automation Engineering. Industrial Applications of Petri Nets. Worldwide Grafcet. Control of Hybrid Systems. Formal Verification for Automation Engineering. Theories for Advanced Control Systems. Control System Engineering. Plenary II: Emerging Technology for Advanced Manufacturing. Microrobotics and Microsystems. C.A.P.P. : Computer Aided Process Planning. Mechatronics: Co-Design of Software and Hardware. Flexible Manufacturing Systems. Advanced Technologies. Product and Manufacturing Cell Engineering. Plenary III: Information Technology for Integration in Manufacturing. Industrial Communication Systems. Petri Nets for Scheduling Manufacturing Systems. Scheduling. Production Planning. Concurrent Engineering. Plenary IV: Intelligent Manufacturing and Process System Engineering. Volume 2. Design of Distributed Architectures by the Interconnection of Intelligent Components. Multi-Agent Manufacturing Systems. Fuzzy Information Engineering I. Fuzzy Information Engineering II. Intelligent Manufacturing System Engineering. Plenary V: Management of Advanced Industrial Systems. Joint Design of Technology and Organisation. Integrated Design: From Theory to Practice. Educational Engineering for Engineers Training. Towards Virtual Reality for Advanced Technology Management. Enterprise Engineering I. Enterprise Engineering II. Manufacturing System Management: Models and Methods. Plenary VI: Industrial Safety, Dependability and Quality. Control Reconfiguration. Process Fault Diagnosis. Economical and Technical Aspects in Industrial Maintenance. Design of Automated Production Systems: Principles of Safety Integration. Integration of Dependability in the Design Process of Production Automated Systems. Quality Dependability and Fault Tolerance. Author index. 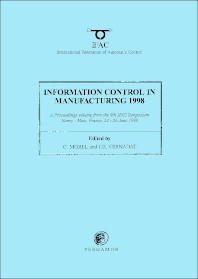 These two volumes contain the Proceedings of the 9th IFAC symposium on Information Control in Manufacturing which took place in Nancy and Metz, France, between 24-26 June, 1998. This INCOM'98 program had six main themes which focused on the role of information for automating manufacturing operations; the role of information for integrating and distributing automated manufacturing activities in the whole Enterprise and; the role of information for enhancing synergies between humans and machines. This year's symposium drew attention from more than 35 countries, and the number of the papers presented was over 200. The scientific relevance of this symposium was sponsored by three International Scientific Societies: IFAC with 6 Technical Committees, IFIP and CIRP, and two National Scientific Institutions: CNRS and INRIA. The industrial relevance of this symposium produced sponsorship by more than 10 companies who actively participated in this event.